Find out how easy it is to add elements of eclectic vintage decor and style to a girl’s bedroom with decorating tips. Part of the New Year New Room Refresh! It’s time for week 3 of a New Year New Room Refresh challenge hosted by Casa Watkins Living! Boy time is flying by. Thankfully, I was able to make a lot of room progress this week and finalized the products going into my daughter’s bedroom refresh. If you are new to the challenge, here’s the scoop. We have one month to “refresh” a room of our choice and will share our progress every Tuesday in January with the final reveal on the 29th. Today I’m sharing easy tips for adding boho vintage decor with wallpaper, bedding, wall art and accessories. 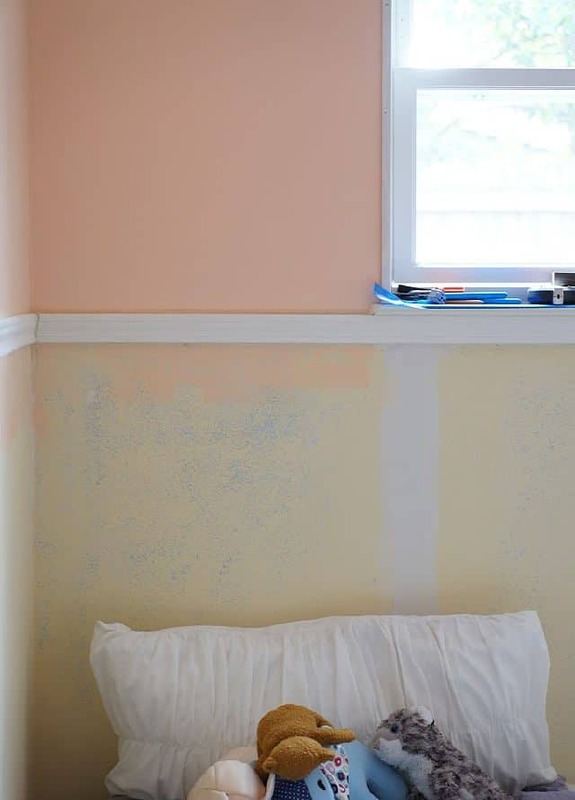 If you are participating with us as a guest, remember to scroll to the bottom of the post and link up your room refresh progress..
Start by adding interest to the walls with paint and/or wallpaper. Vintage, boho, and eclectic all scream maximalist to me but that doesn’t mean you have to get crazy! My daughter chose a fun art deco looking wallpaper from Milton & King called From Up Here. They have so many great prints and we are really excited to get it up!! The entire room wallpapered could be overwhelming so I’m toning it down with a soft color on the ceiling and upper walls and only installing wallpaper on the lower half. The wallpaper and paint will be separated with chair moulding for a clean break. When you are trying to add different style elements of bedding think outside the box. Find a pillow repurposed from a vintage quilt, piece of clothing, or in this design board, a Japanese obi. Mix different fabrics like silk, velvet, cotton, and linen. Mix and match with solids, florals, geometrics, and abstract or organic lines varying the scale of the prints. Shop different stores and handmade shops for the perfect mix. I always enjoy working with Boho Luxe Home to add boho touches to a space and what better pillow to start with than one made from a vintage Japanese obi. If you didn’t know, we just moved back from Japan so any textile from there brings back sweet memories. An obi is the sash that ties around a kimono or yukata. And as you can see, they are perfect for home decor! The velvet pillow with tassels has a colorful trim around it for extra detail. I found it very easy to find corresponding pillows from Loom Decor. Their website makes it very easy for custom sizes and colors with fabrics organized by tones and patterns into different color families. I plan on layering a reversible pillow cover with blues and yellows and a beautiful floral called “wilder nest orchid” boudoir pillow with the vintage boho picks. The abstract and modern prints will balance the heavier fabric and print beautifully. Artwork: Mix and match frames and matting with personal pictures and art for an eclectic mix. Consider warm metallics like gold/brass and light wood tones for boho vibes. Try color matting in a traditional frame for a vintage look. Fine tuning just the look I wanted for wall art was very easy with Art to Frame‘s online customizations. They made the process very simple by the having a feature to upload directly the pictures I wanted framed and an extensive library of frame and mat options. You can take the look from fresh and modern to classic chic and everywhere in between. I also took advantage of one of their decorative patterned bulletin boards that is gorgeous enough to be wall art in itself. It’s a far cry from old school bulletin cork boards. My daughter is probably most excited for this new addition! Accessories: It can be tricky to keep styling cool and eclectic without looking outdated and clutter. Try mixing vintage decor with modern elements like marble, blush pink, mint, white, and gold for fresh boho style. I’m looking forward to putting the final touches to my daughter’s room with a beautiful traditional area rug in jewel tones from Home Dynamix, a gorgeous modern table lamp from Hudson Valley Lighting Group, another boho element with Boho Luxe Home’s pink lotus tassel, and a few fun and inexpensive accessories from Ikea. Last but not least, painted furniture is a must for vintage boho style! Did you spy the mint dress in my mood board? Well, it’s only for inspiration. I plan on giving my daughter’s dresser a makeover with Velvet Finishes cosmopolitan paint and I might paint another thing or two…. I’ll leave it as a surprise. Here’s the ol’ to-do list. I completed some major tasks last week so we are right on schedule! Here’s a progress peek! We are ready for wallpaper!! I hope you are as excited as we are to refresh a space this month. Make sure to check out the other participating bloggers below and link up your own room makeover if you are joining us. Oh boy Kathy! You are killing the pattern mixing here. I love it! That color pink is pretty. I’m picking out our pink this week too. Fun! Thanks for the sweet comment. I had fun mixing patterns! I’m loving it all! Can’t wait to see it done! Ohh I love boho vintage style! Awesome!